Wild mushrooms are much more flavourful than the cultivated variety of button mushrooms we normally get in the cities. 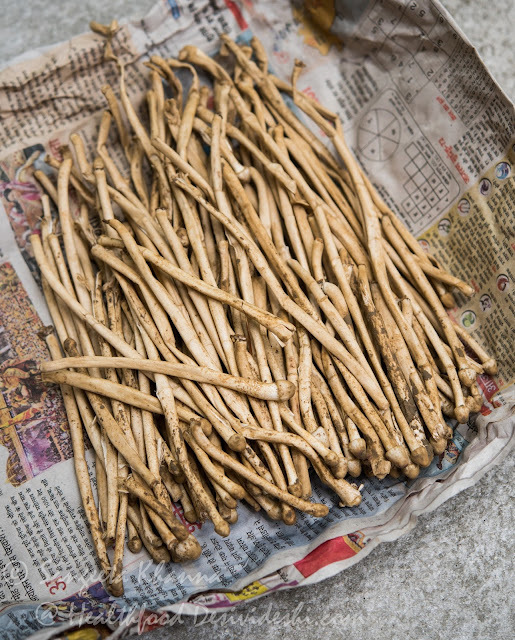 We do get some Enoki, Shiitake, Oyster mushrooms, Portobello and even some dried Morels as well in Delhi but getting fresh wild mushrooms is almost impossible unless one travels to the places where they grow. I was lucky last month when my brother was driving to Delhi from Lakhimpur (a small town located in the Terai region of Himalayas) and this was the season of the wild mushrooms being harvested by locals. I requested him to bring some and he brought 2 huge bundles with 2 different types of mushrooms. One of them was this slender mushroom called as dharti ka phool in local parlance which means flowers of the Earth. 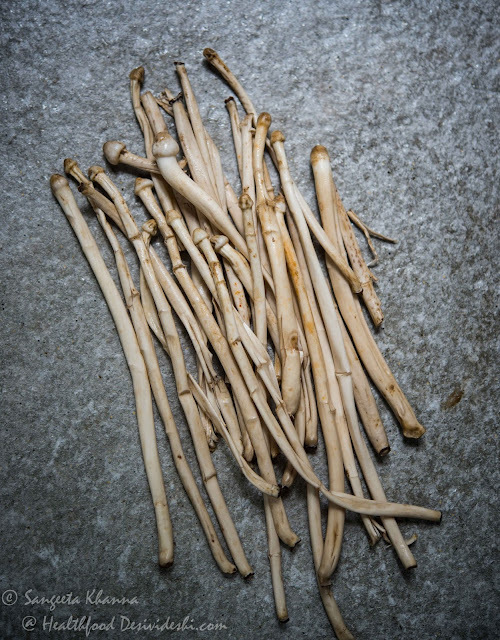 The species of this mushroom is Macrolepiota (source). Definitely one of the tastiest mushrooms I have tasted so far. These need to be cleaned really well and then chopped very fine to get more flavour. Pearl barley risotto has been a favourite whenever I get some mixed mushrooms or wild mushrooms like this. If you don't get any wild mushrooms you can always make this pearl barley risotto using button mushrooms as well. Barley is a low Glycemic index ingredient and can be used in innovative ways. 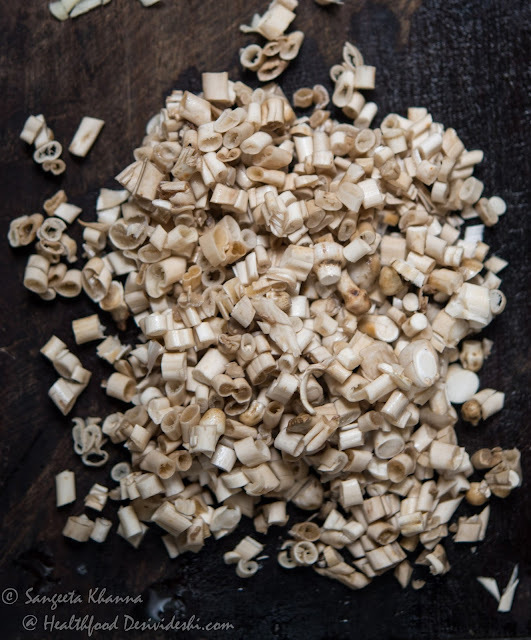 Note that pearl barley can be served just like rice or can be stir fried with vegetables or seafood or even chicken to make a one pot meal. This pearl barley risotto is a one pot meal too if you are not too fussy about having proteins in every meal. Well, mushrooms are also a fairly good source of proteins apart from boosting immunity (source). Start cooking the pearl barley first with water. Add a cup of water, 1 tsp butter and a little salt to a deep pan along with pearl barley and cook on low flame till almost all the water is absorbed and pearl barley become almost 4 times it's original size. I prefer pressure cooking the pearl barley. Discard the tejpatta and reserve barley along with any remaining liquid. 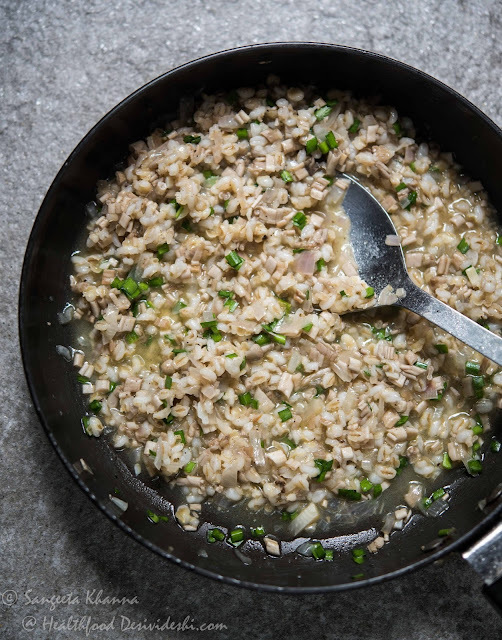 Note that in the case of pearl barley the risotto recipe with be different from Arborio or Carnaroli rice as the starches (amylopectin) of the barley releases while it cooks in water. It doesn't need to be cooked like the traditional risotto. Chop the mushrooms fine. It is always better to use 2-3 varieties of mushrooms if you don't have access to wild mushrooms like this. Heat 1 tbsp olive oil along with onions and garlic in a pan and cook till it all becomes translucent. Note that the garlic and onion mix (soffrito) should not get browned at all. Add the mushrooms, salt and pepper and cook while stirring occasionally for 5 more minutes. Add the cooked barley, mix well and add splashes of white wine or diluted pineapple juice while cooking. Add the garlic chives and marjoram and cook for a couple of minutes. The pearl barley risotto looks like this when done. Drizzle with some olive oil and may be a little butter too. Adjust seasoning. Empty in a serving bowl and add grated Parmesan if you wish. I skipped that because I wanted to taste the wild mushrooms without getting masked by any other flavours. The best thing with this pearl barley risotto is that it doesn't get congealed when cold. I enjoyed the leftovers next day after reheating it and it was as good as fresh. 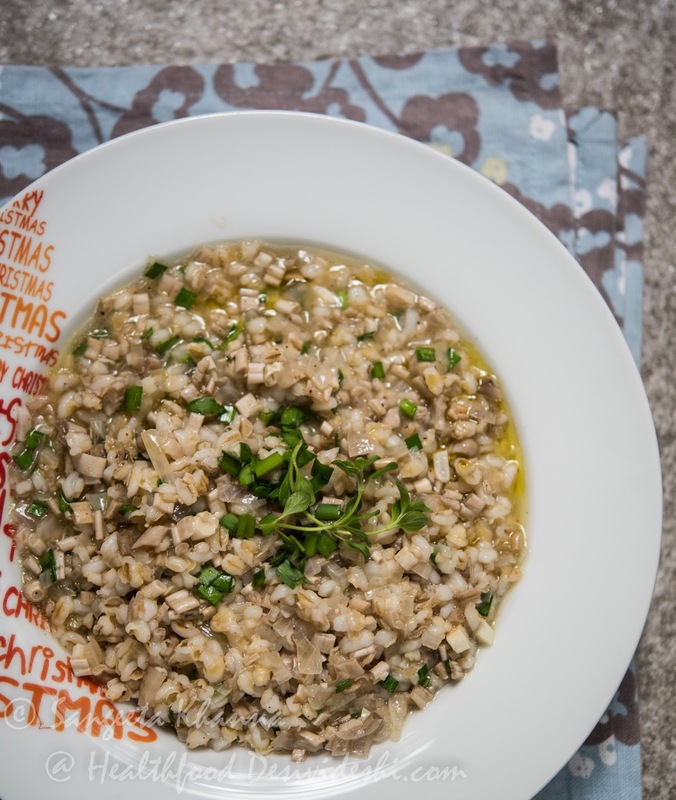 No need to add Parmesan or any other cheese to this pearl barley risotto. The creaminess of barley and the flavour of mushrooms enhanced delicately by tejpatta, garlic chives and marjoram is a wonderful treat for the senses. 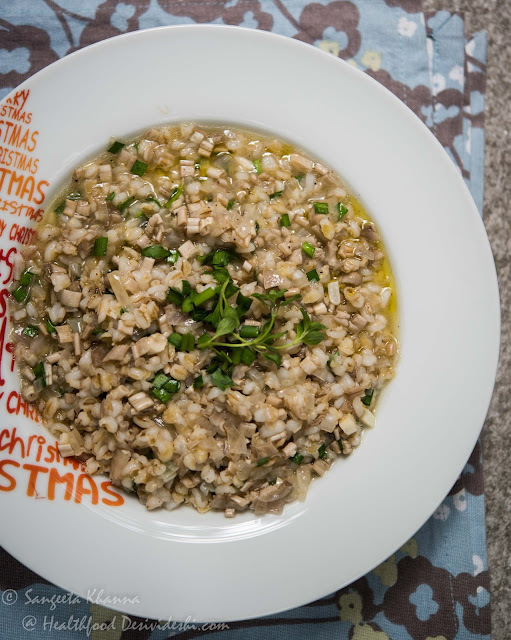 Try this pearl barley risotto with any other mushrooms you get and tell me if you like it. wow those wild mushrooms are precious! The pearl barley dish looks super tasty. Sounds delicious, will definitely try.